Sun Lakes Art on the Lake has been scheduled for Saturday March 3, 2018. If you have been to the Sun Lakes Art on the Lake show in the past, you know it is a great time with 80 to 90 artists showing and selling their artisan goods. You will find everything from paintings to jewelry to woodwork, pottery and more! So, come on out between 9 am and 2 pm for some great art, music and BBQ. Part of the proceeds from the show will benefit the Emergency Relief of the Sun Lakes Fire Department. Come out to see the artists, their beautiful hand made wares and enjoy lunch grilled by the Sun Lakes Fire Department. Music will also be provided. The Sun Lakes Art on the Lake is located at Cottonwood Country Club just across the street from the tennis courts on Brentwood Drive. Find a parking space and stroll around the lake on the walking path. 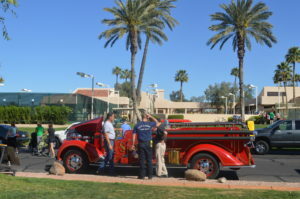 Find some beautiful treasures and benefit a great group – our Sun Lakes Fire Department! 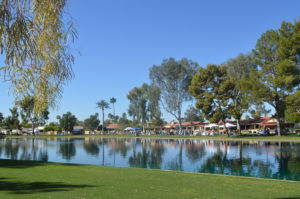 If you would like more information about future Sun Lakes Art on the Lake events or real estate in Sun Lakes, Arizona, contact us here or call 480-440-0849.